Matter and energy have a very curious property. They interact with each other in predictable ways and the more energy an object has, the smaller length scales it can interact with. This leads to some very interesting and beautiful results, which are best illustrated with some simple quantum electrodynamics (QED). QED is the framework for describing the interactions of charged leptons with photons, and for now let’s limit things to electrons, positrons and photons. An electron is a negatively charged fundamental particle, and a positron is the same particle, but with a positive charge. A photon is a neutral fundamental particle of light and it interacts with anything that has a charge. 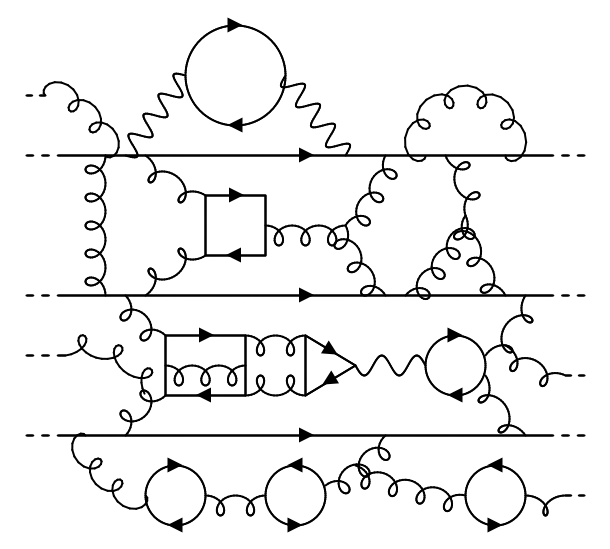 In this diagram, time flows from left to right, and the paths of the particles in space are represented in the up-down direction (and two additional directions if you have a good enough imagination to think in four dimensions!) 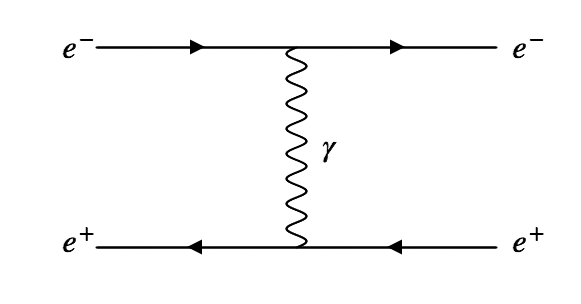 The straight line with the arrow to the right is an electron, and the wavy line is a photon. 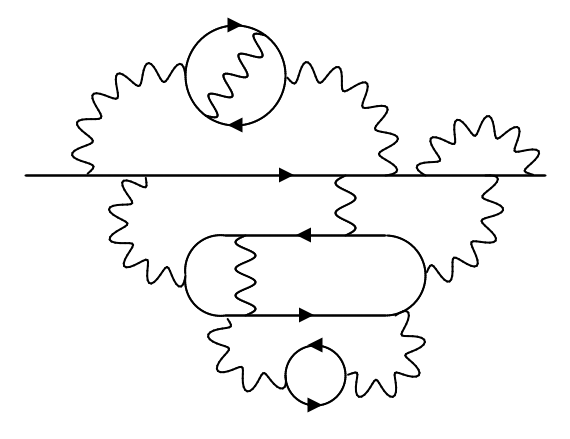 In this diagram an electron emits a photon, which is a very simple process. 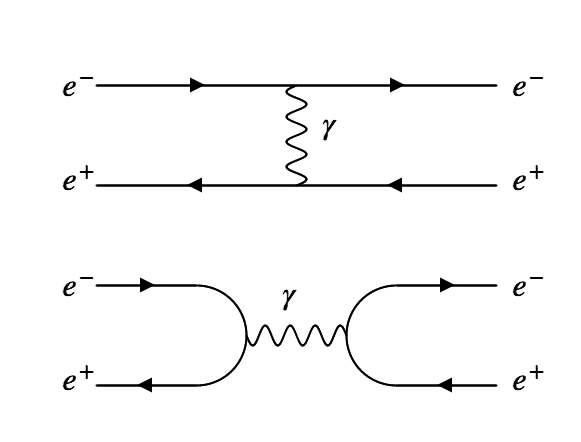 In this diagram the line with the arrow to the left is a positron, and the electron and positron exchange a photon. Here an electron and positron annihilate to form a photon. What happens in the middle? According to quantum mechanics, everything possible! A fun game to play in you’re bored in a lecture is to see how many unique ways you can add a photon to a diagram. At each step the distance we consider is smaller than the one before it, and the energy needed to probe this distance is larger. When we talk about an electron we usually think of a simple line, but real electrons are actually made of a mess of virtual particles that swarm around the central electron. The more energy we put into probing the electron’s structure (or lack of structure) the more particles we liberate in the process. There are many diagrams we can draw and we can’t pick out a single one of these diagrams as the “real” electron, as they all contribute. We have to take everything to get a real feel of what something as simple as an electron is. As usual, things are even more complicated in reality than this simple picture. To get a complete understanding we should add the other particles to the diagrams. After all, that’s how we can get a Higgs boson out of proton- in some sense the Higgs boson was “already there” inside the proton and we just liberated it by adding a huge amount of energy. If things are tricky for the electron, they are even more complicated for the proton. Hadrons are bound states of quarks and gluons, and while we can see an individual electron, it’s impossible to see an individual quark. Quarks are always found in groups, so have the take the huge fractal into account when we look inside a proton and try to simulate what happens. This is an intractable problem, so need a lot of help from the experimental data to get it right, such as the dedicated deep inelastic scattering experiments at the DESY laboratory. Except those extra bits would go on forever to the left and right, as indicated by the dotted lines, and instead of happening in one spatial dimension it happens in three. 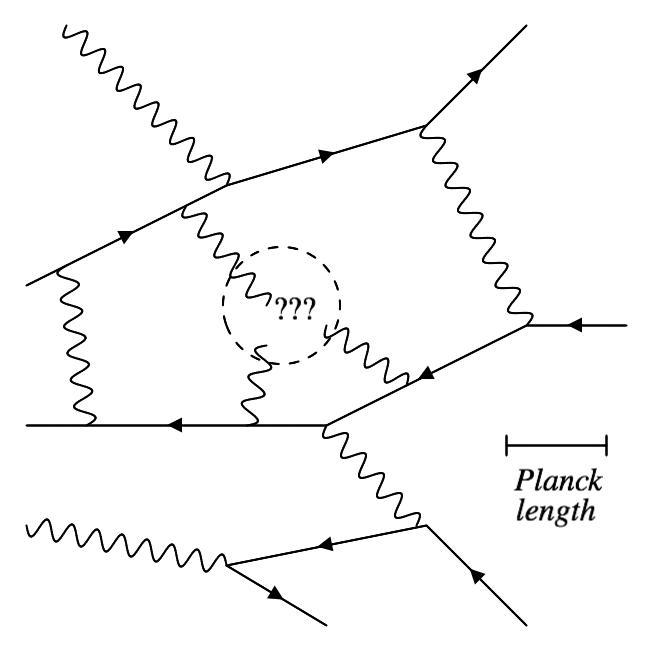 To make matters worse, the valence quarks are not just straight lines as I’ve drawn them here, they meander to and fro, changing their characteristic properties as they exchange other particles with each other. Each time we reach a new energy range in our experiments, we get to prober deeper into this fractal structure of matter, and as we go to higher energies we also liberate higher mass particles. The fractals for quarks interact strongly, so they are dense and have high discovery potential. The fractals for neutrinos are very sparse and their interactions can spread over huge distances. Since all particles can interact with each other directly or through intermediaries, all these fractals interact with each other too. Each proton inside your body contains three valence quarks, surrounded by a fractal mess of quarks and gluons, exactly the same as those in the protons that fly around the LHC. All we’ve done at the LHC is probe further into those fractals to look for something new. At the same time, since the protons are indistinguishable they are very weakly connected to each other via quantum mechanics. In effect the fractals that surround every valence particle join up to make one cosmological fractal, and the valence particles just excitations of that fractal that managed to break free from their (anti-)matter counterparts. The astute reader will remember that the title of the post was the seemingly fractal nature of matter. Everything that has been described so far fulfils the requirements of any fractal- self similarity, increased complexity with depth and so on. What it is that makes matter unlike a fractal? We don’t exactly know the answer to that question, but we do know that eventually the levels of complexity have to stop. We can’t keep splitting space up into smaller and smaller chunks and finding more and more complex arrangements of the same particles over and over again. This is because eventually we would reach the Planck scale, which is where the quantum effects of gravity become important and it becomes very difficult to keep track of spatial distances. I find it mind boggling how such simple ideas can result in so much beauty, and yet it’s still somehow flawed. Whatever the reality is, it must be even more beautiful than what I described here, and we’ll probably never know its true nature.